Edward Charles Man was born on 19 January 1850, at 17 Spencer Place, North Brixton, Kennington, Lambeth, Surrey, the son of Edward Desborough and Louisa Mary (Harris) Man and was baptized on 6 March at Holy Trinity, Clapham Common North Side, Surrey and he died probably in Australia. Edward belongs to Man Generation Nine. It was reported that Edward went to Australia at age 20 after an argument with his father and never heard from again. 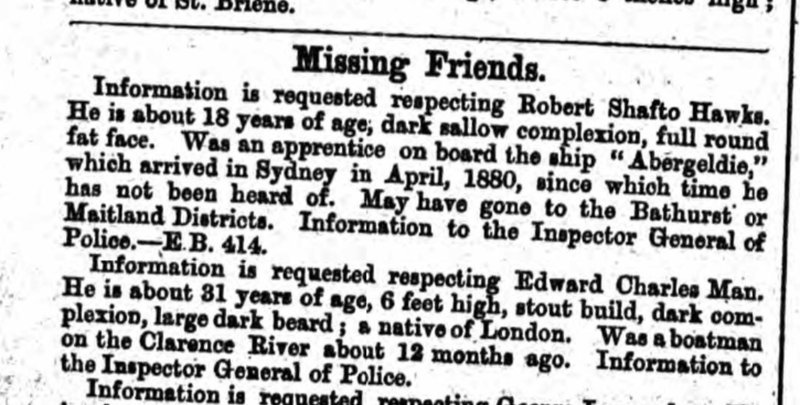 The following missing notice from the New South Wales Police Gazette is from 1881. Authority of New South Wales; Police Gazettes. Year: 1881; Page: 38. So far all attempts to find marriage and death records for him in Australia have been unsuccessful. The missing notice above does not bode well.